Researchers have found that high levels of a blood protein, suPAR, combined with a common genetic mutation in African Americans accelerate the progression of chronic kidney disease. The findings are reported today in Nature Medicine. The study, conducted by researchers from Emory University, Rush University, Harvard University, Johns Hopkins, the National Institutes of Health and the Israel Institute of Technology, looked at two well-known genetic risk factors for chronic kidney disease (CKD) in African Americans, the mutated G1 or G2 variations in the gene known as Apolipoprotein L1 (APOL1). To be at risk for developing CKD, an individual must have inherited two of these gene variants, one from each parent. Between 15 and 20 percent of African Americans carry a genetic mutation of the APOL1 encoding gene that puts them at a high risk of CKD, but only about half of them develop the illness – a variance that long has puzzled researchers. CKD is a progressive failure of function that prevents kidneys from fulfilling their role to filter waste from the blood stream. Known as a silent killer, it can cause severe organ damage before symptoms (blood in the urine, swollen hands and feet, excessive thirst) develop. In the advanced phases, patients develop serious complications, including cardiovascular disease and eventually the kidneys fail. "Our landmark study finally provides a potential explanation for how the APOL1 gene variants lead to kidney disease. The gene mutation's toxic effects require high suPAR levels as a catalyst leading to rapid worsening of kidney function," says Salim S. Hayek, MD, first author of the study and Emory University cardiology research fellow at the Emory Clinical Cardiovascular Research Institute (ECCRI). Hayek says the kidney function of patients with APOL1 mutations who have low suPAR stays relatively stable. "Those who have both the APOL1 mutation and high suPAR levels, however, have more rapidly worsening disease. We think this is because suPAR and mutated APOL1 proteins bind together to activate a mechanism leading to the destruction of kidney cells," explains Hayek. Researchers analyzed blood for suPAR levels, screened for APOL1 gene mutations, and measured kidney function from two separate cohorts of African American patients – 487 people from the Emory Cardiovascular Biobank, 15 percent of whom had a high-risk APOL1 genotype; and 607 from the multi-center African American Study of Kidney Disease and Hypertension, including 24 percent with the high-risk mutation. Using these two large, unrelated cohorts, the researchers found that the rate of progression of kidney disease in patients with the APOL1 mutation was highly dependent on the plasma suPAR levels: APOL1-related risk was reduced in lower, and strengthened in higher levels of plasma suPAR. The team then went on to use purified proteins and examine whether suPAR and APOL1 bind to each other, and found that the mutated G1 and G2 variants, together with suPAR, synergistically activated certain receptors on kidney cells. This leads to the activation of a mechanism, resulting in "self destruction" – also known as autophagy – of kidney cells. 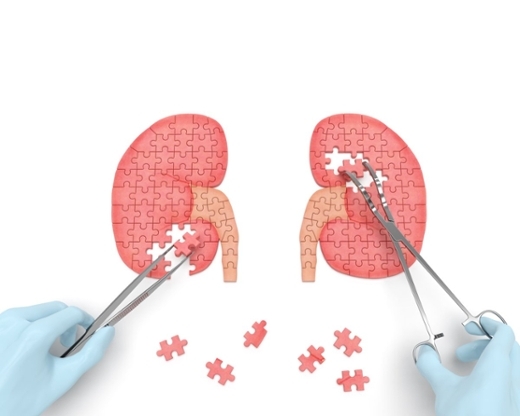 Using cell models and genetically engineered mice, the authors then could reproduce kidney disease changes upon expression of APOL1 gene variants only in the presence of high suPAR levels. This study solidifies earlier findings of suPAR's general role as a kidney disease marker and risk factor for the disease. It may ultimately help clinicians identify patients that need early intervention to prevent progression to kidney disease," says Arshed Quyyumi, MD, co-author of the study and co-director of the ECCRI. In November 2015, Hayek, Quyyumi and study colleagues published a New England Journal of Medicine study that showed high levels of suPAR could be an indicator of future kidney disease much like cholesterol and blood pressure levels help predict heart disease. Lifestyle and environmental pressures such as smoking promote the rise in suPAR levels produced by bone marrow cells and puts people at high risk of kidney disease. Once elevated in the blood, suPAR is associated with inflammation and kidney disease, including a scarring type that senior author Jochen Reiser MD, PhD, Rush University Medical Center, has spent his career studying: focal segmental glomerulosclerosis. "What we are learning today is that suPAR in a general way is to kidneys what cholesterol is to the heart, a substance that can cause damage if levels rise too high, or a substance that can likely make many forms of kidney disease worse," Reiser says. Based on these fundamental insights, suPAR level testing may become a routine test at many institutions around the world. Like cholesterol, suPAR levels vary from person to person. Some environmental factors can contribute significantly to elevated suPAR levels. "Lifestyle is a big factor, bigger than we thought," Reiser says. Researchers say that smoking, weight gain and even frequent kidney infections can add up and send suPAR to dangerous heights. Weight loss and smoking cessation can help bring levels down. Until new therapies are developed to block suPAR, avoiding smoking and living a healthy life are the only measures that can keep suPAR levels low.